Is your schedule as crazy as mine this month?! I don’t know about you, but I sure wish I had an extra few hours to work with each day. Since returning from our Thanksgiving vacation, time seems to be rushing straight towards Christmas. And there’s still so much to do! Our tree is up in the living room, lit, but undecorated. Our dining room table has been covered with holiday cards in various stages of preparation for days. I finally checked a few things off my list today, but wow! I can’t even imagine how everyone out there with kids gets through the month of December. You are all superstars! I do have time to do some cooking though! Last week I was able to talk Evan into having breakfast for dinner. This is not something he prefers, but he agreed after I showed him what I planned to cook. The result was too good not to share! 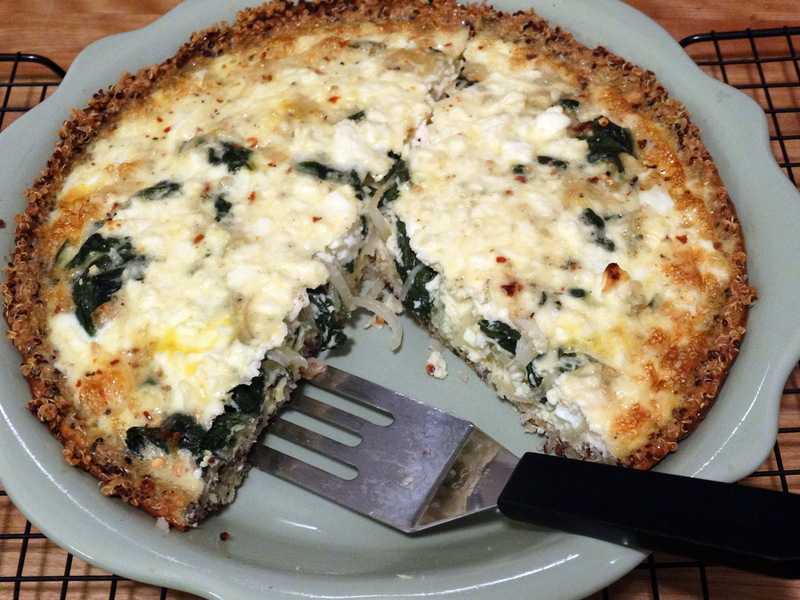 This quiche recipe tastes amazing and doesn’t require a whole lot of work. It’s also healthy and gluten-free! You will need 2 cups cooked, chilled quinoa, 1/8 teaspoon freshly ground pepper, 1 large egg, and cooking spray for the crust. 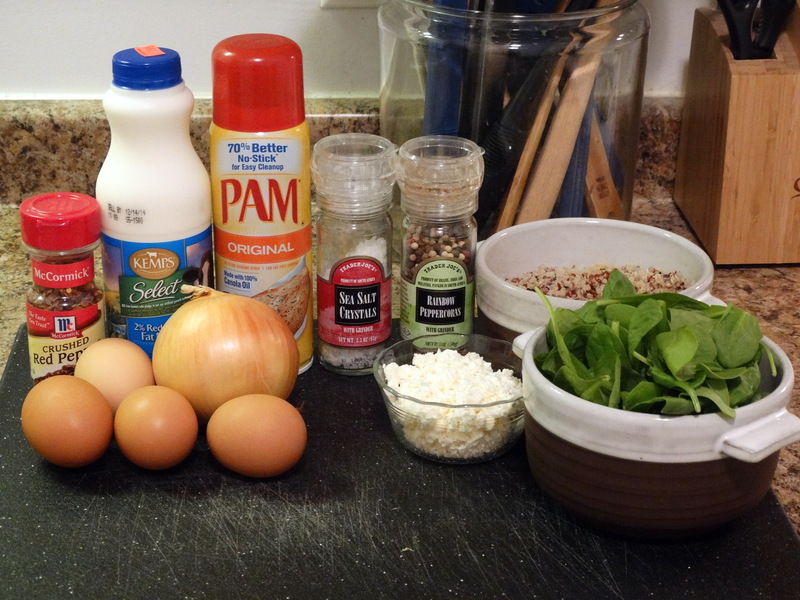 The filling requires 1 teaspoon canola oil, 1/2 an onion, 5 ounces baby spinach ,1/2 cup low-fat milk, 1/2 teaspoon coarse sea salt, 1/4 teaspoon freshly ground pepper, 1/4 teaspoon crushed red pepper flakes, 4 large eggs, plus 2 egg whites, and 1.5 ounces crumbled feta. To prepare the crust, preheat the oven to 375 degrees. Beat one egg and 1/8 teaspoon freshly ground pepper in a small bowl. Mix in the quinoa until evenly coated. Spray a 9-inch pie dish with cooking spray. 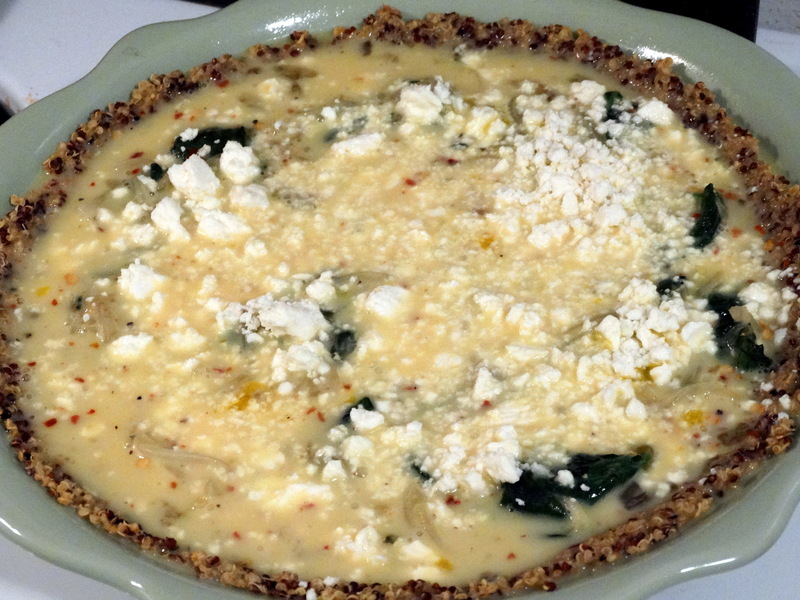 Press the quinoa mixture into the pie dish until the bottom and sides are covered evenly. Bake the crust for 20 minutes. When the crust is done, let it cool. 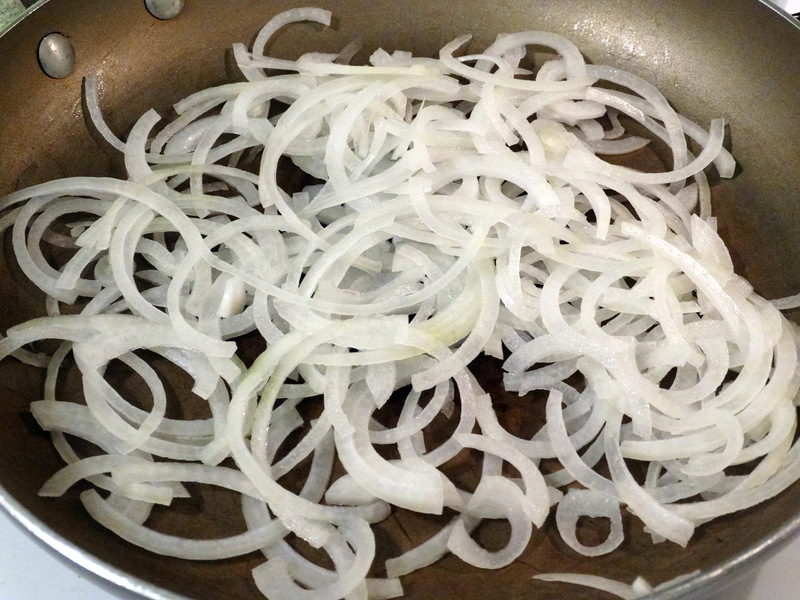 While your crust is baking, thinly slice half an onion and sauté it in a non-stick skillet with 1 teaspoon canola oil until soft and translucent, about 5 minutes. When the onion is cooked, add 5 ounces baby spinach to the pan. 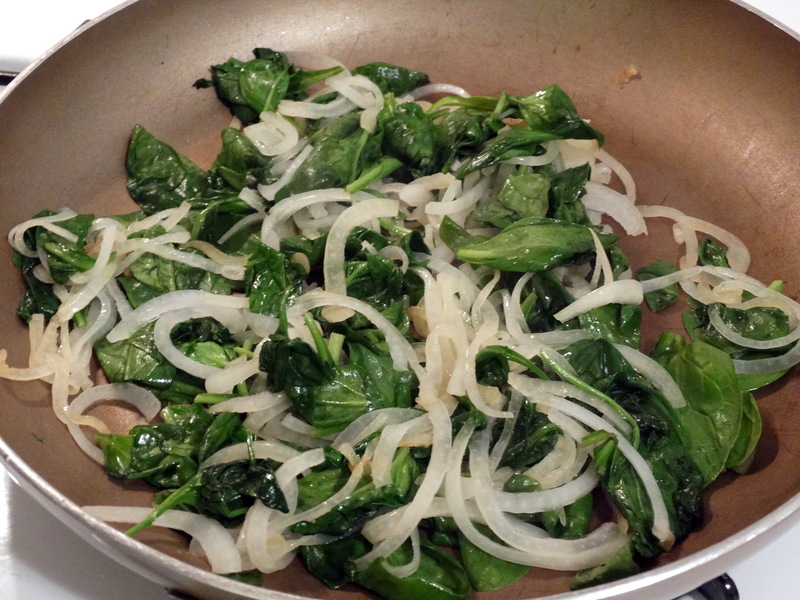 Sauté for an additional 3 minutes or until the spinach is wilted. Remove the pan from heat and let the veggies cool. 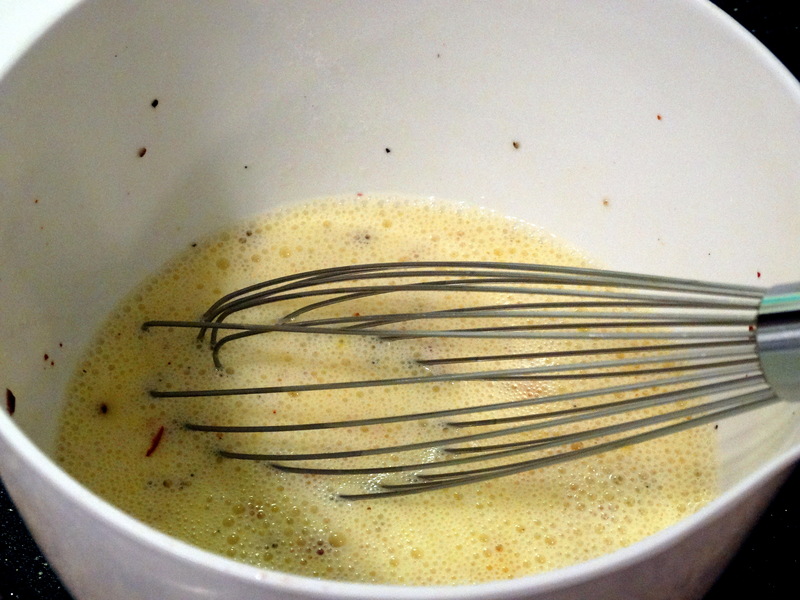 Next, whisk together 1/2 cup low-fat milk, 1/2 teaspoon coarse sea salt, 1/4 teaspoon freshly ground pepper, 1/4 teaspoon crushed red pepper flakes, 4 large eggs, and 2 large egg whites in a medium bowl. Add the onions and spinach to the cooled crust, covering the bottom. Pour the egg mixture over the veggies. I was skeptical it would all fit, but it did! Sprinkle 1.5 ounces of crumbled feta cheese over the top. Bake your quiche for 35 minutes. Let it stand for 5 minutes before serving. Enjoy! 1) To prepare the crust, preheat the oven to 375 degrees. 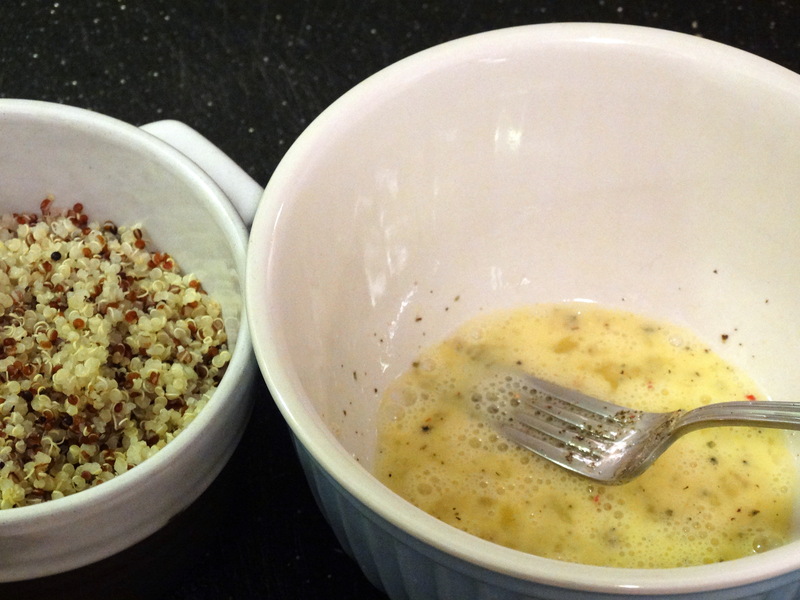 Beat one egg and 1/8 teaspoon freshly ground pepper in a small bowl. Mix in the quinoa until evenly coated. Spray a 9-inch pie dish with cooking spray. 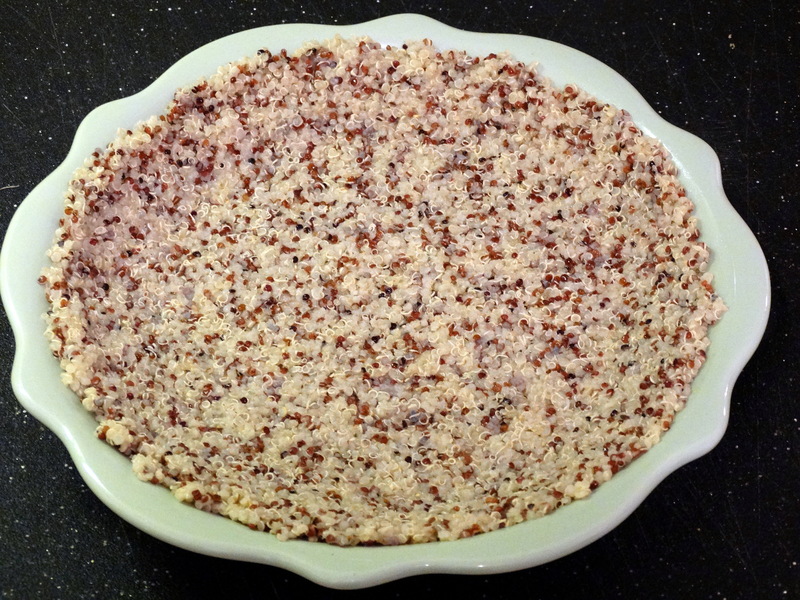 Press the quinoa mixture into the pie dish until the bottom and sides are covered evenly. Bake the crust for 20 minutes. When the crust is done, let it cool. 2) While your crust is baking, thinly slice half an onion and sauté it in a non-stick skillet with 1 teaspoon canola oil until soft and translucent, about 5 minutes. When the onion is cooked, add 5 ounces baby spinach to the pan. Sauté for an additional 3 minutes. Remove the pan from heat and let the veggies cool. 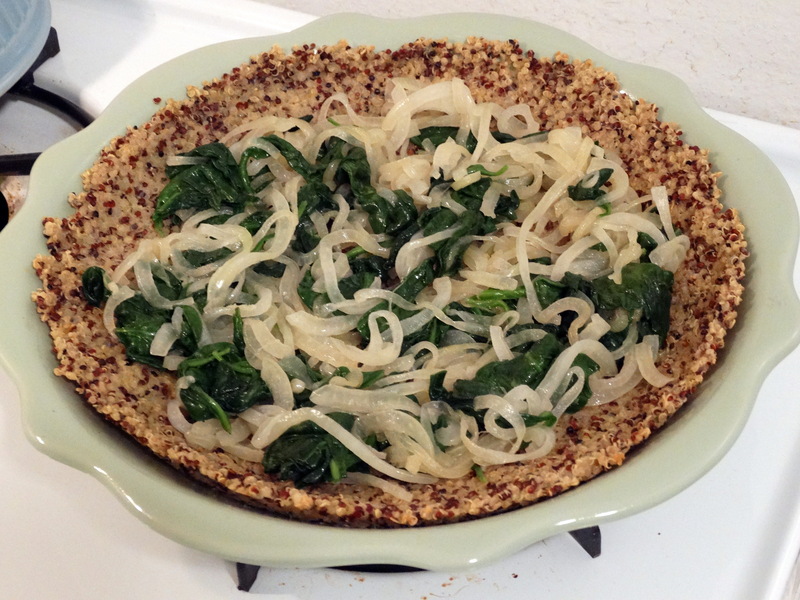 3) Add the onions and spinach to your pie dish, covering the bottom of the crust. Pour the egg mixture over the veggies. Sprinkle 1.5 ounces of crumbled feta cheese over the top. Bake for 35 minutes. Let stand for 5 minutes before serving. I shouldn’t have read this while I was hungry! Oooooo….so looking forward to trying this! !